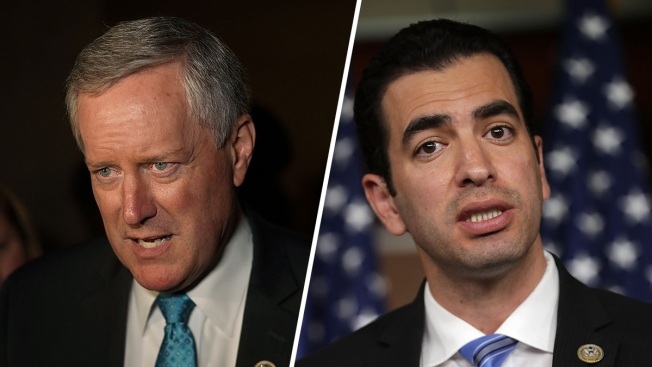 U.S. Rep. Mark Meadows (R-NC) left, Rep. Ruben Kihuen (D-NV) right. Reps. Ruben Kihuen, D-Nev., and Mark Meadows, R-N.C., have been formally sanctioned by the House Ethics Committee over sexual harassment allegations, the panel announced Friday in reports released to the public. Kihuen violated House rules by “making persistent and unwanted advances toward women who were required to interact with him as part of their professional responsibilities,” NBC News reported, while Meadows failed to take decisive action to deal with complaints concerning a key aide. The report details three women’s accounts of advances by the congressman in graphic detail. After these allegations came to light earlier this year, Kihuen refused to resign, but announced that he wouldn’t see re-election. He’s still a sitting member of Congress and voted in the House on Friday.